If you missed out on our weekly Facebook Live show, no worries! You can watch the replay here! Or maybe you caught the show live, but you want to know more about everything we used during the on-air demonstration–then this is the post for you! This week we had special guest CHRISTINA GRIFFITHS aka Queen of Die-cutting! It’s such a treat to have this crafty wizard in the studio! And we had a ball talking about the latest Pretty Quick Papercut Birds collection as well as having a play with different die-cutting machines! We also had Christina do quite a bit of die-cutting on 3 different machines. What a trooper! 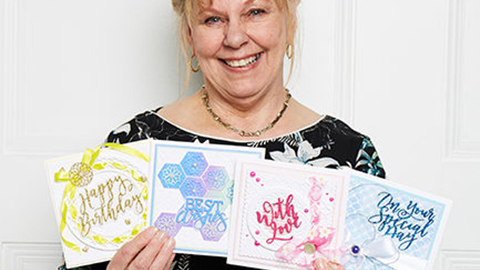 She worked with a Spellbinders Platinum (her favourite), a Cricut Cuttlebug, and a Gemini Jr. Such different machines, but all with great results. She shared lots of tips throughout as well as shared some paper piecing ideas. (Love that technique? Here’s some top paper piecing tips!) Plus she had an exclusive announcement which was only for anyone watching live or watching the replay. It’s not too late to get in on the secret by watching the broadcast (but hurry because it’s only for a limited time)! We hope you enjoyed the broadcast. We always have such a great time with Christina, sharing new products, plus having a laugh. And again a huge CONGRATULATIONS to our 3 winners, Linda V., Marie C., and Jennifer B.! We’ll be sending out your prizes shortly!